I approached the backyard gate with excitement and anticipation. I was ready to see a red tail hawk, the type of bird seen throughout our neighborhood, but my sight locked eyes with a different feathered friend. Our backyard visitor was an owl. He looked around, surveying the yard. I watched as his head seemingly turned around completely. I was fascinated. Eventually, I pulled myself away from the owl. He seemed in no hurry to fly off into the sunrise, and I was thirsty for some cold water. With my thirst quenched, my thoughts returned to the owl. I grabbed my camera and walked out to the back deck, hoping he would still be perched in the tree where I last saw him. There he was – in all his glory. I noticed something else, this time. Cherokee was parked next to another tree, staring straight up. I tried to get her attention, but I was unable to break her concentration. When I glanced at the owl, I realized he was looking in the same direction. What was up the tree, I wondered to myself. 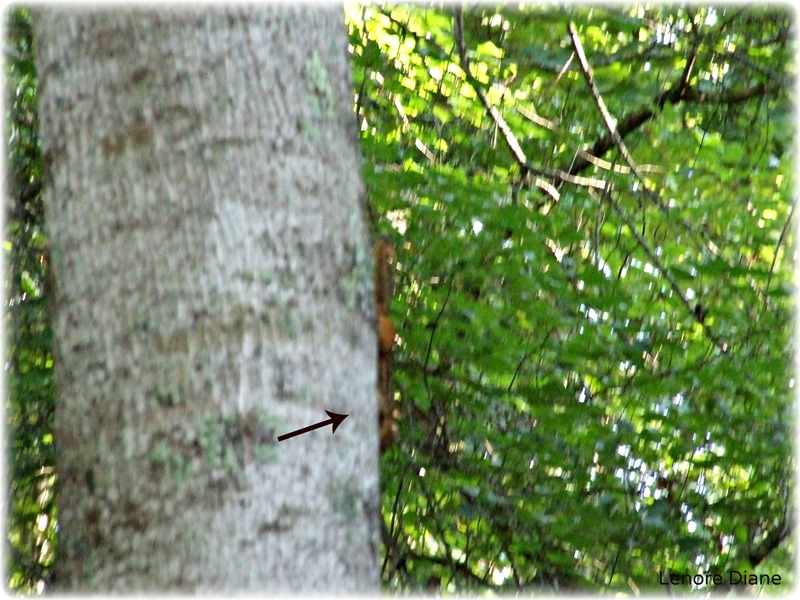 I tried to capture a picture of the chipmunk, but it was too quick for me. He had me in a good game of run around the tree, and I lost. Suddenly, I heard a few quick chirps. The chipmunk was making a run for it. He scurried down the tree through the tall weeds and leaves. 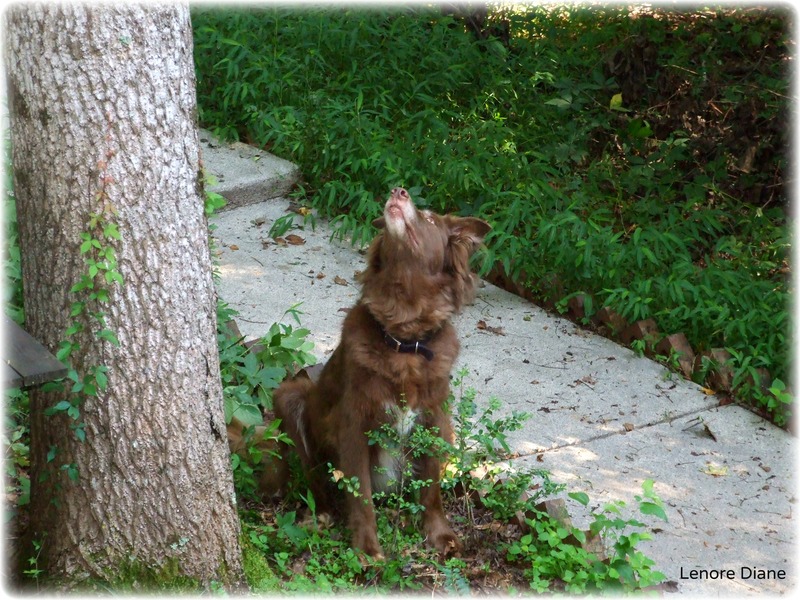 Cherokee darted, in an attempt to capture the downed chipmunk. Wilbur joined her, always wanting to lend his sister a paw – or four. But the chipmunk made it to a second tree, and scurried up as quickly as it had scurried down. Wilbur and Cherokee sneezed in unison, as if they were telling off the chipmunk. I decided to intervene with Mother Nature, and I tried corralling Wilbur and Cherokee. I wanted to bring the pooches inside, giving the chipmunk a chance to catch it’s breath. When unexpectedly and in the blink of an eye, the owl swooped from his perch, flew by the side of the tree where the chipmunk panted in exhaustion, snatched the chipmunk with its talons, and flew away effortlessly. Stunned at first, Wilbur and Cherokee looked at each other, clearly questioning what had just happened. I was trying to comprehend it, too. Then Wilbur and Cherokee chased the owl, vowing to get what was rightfully theirs in the first place. But the owl was too quick and well – it had the power of flight. 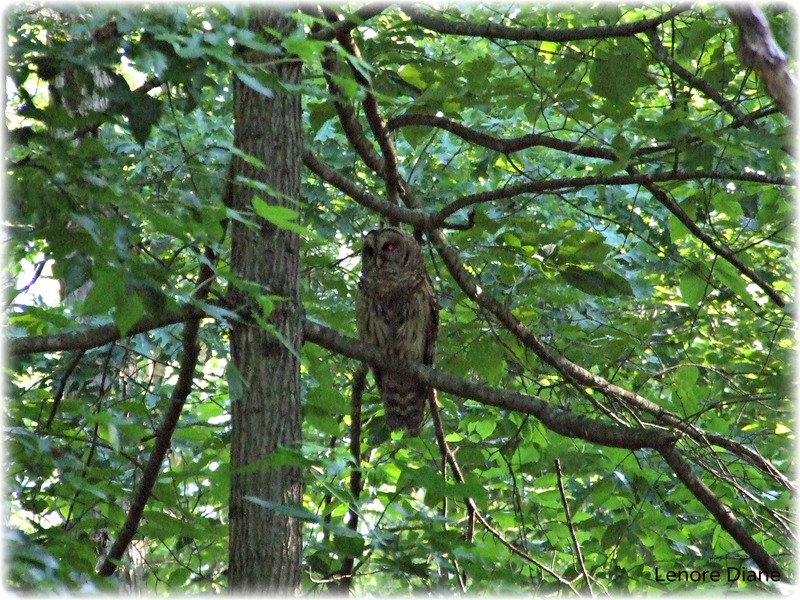 I watched as the owl flew out of our backyard and disappeared further into the woods, clutching its breakfast tight. I send my condolences to the chipmunk family. For what it is worth, I don’t think the chipmunk suffered. Wilbur, Cherokee, and I did not see the owl coming, and I don’t think the chipmunk did, either. Though we try to intervene from time to time, Mother Nature remains in control. Wow. Great pics. Nice work, LD. Thank you very much, K8. I was in the right place at the right time. Sadly, the chipmunk cannot say the same. What she said – WOW!!! Or should that be wOWL! Ha!! The funny thing is – I forgot about the owl for a split second. The initial point of me being in the backyard and stalking the owl was to try to photograph him taking flight. I suppose what I witnessed was far better than a snapped photo. I love the photo of the owl in the tree. The capture and colors are perfect! Well written story, too, Lenore. Can you believe you were actually there when all that took place? A witness to nature. Well conveyed with words and photos. Thanks, Carol. I was blown away. I repeated the word “wow” several times. It was amazing – truly amazing. Thanks for reading!! Oh Lenore…that was AMAZING! I actually got the chills with that. What an amazing experience!! Thanks, Kim – fascinated and amazed are the words I seem to use over and over again. It was so cool. This is a revealing story of the spectacle of nature … right in your own back yard. Wilbur and Cherokee are truly wise, Lenore. Right in my own backyard… exactly! I am grateful to have such a close seat to wildlife. I never tire of it, Maxi. What a sight! That truly is amazing. Thank you Country Wife. I was thrilled to be a witness to Mother Nature herself. What a scene you captured–owls can seem creepy but are pretty cool too! Owls do seem slightly spooky, Bella. Because it was in the morning and not a dark night, my fear was replaced with fascination. ‘Fascination’ – that seems to be the word I am using over and over again. I was at the right place at the right time, Mags. And yes – it was an incredible sight. Thank you for visiting! I didn’t scream, but the “Wow” I exclaimed over and over again was not soft-spoken. I’d still be screaming now. Well! *huffs* I had a right hard ol’ time liking this post, Lenore! My gosh. Chipmunk slaughter. No wonder my poor, fuzzy, little critters always look so nervous! Everyone’s out to get them! I’m sorry, Jules. I realize I neglected to put a warning at the start of the story. I know your fondness for chipmunks. I hope you find comfort in the fact that the owl enjoyed his breakfast, and he shared it with his little owl babies. That’s amazing. Awesome pics Lenore! Hi GMom! Thanks for reading. I am glad you liked the story and pictures. I did, too. You don’t usually see owls out in the day time, so you were very lucky to have witnessed that whole scene. I do feel bad for the little chipmunk though, but I’m sure vegetarians say that about cows and chickens, etc. Yes, I felt sorry for the chipmunk, but it is the circle of life. I saw two owls last night. Once again, I was fascinated by their behavior. Magnificent animals. I’m grateful they are taking up residence in our neighborhood. I loved the photo and am glad that you were able to capture the entire escapade. Owls are beautiful, intelligent animals and if you research their links to folklore, they play a significant role in many cultures. We have an owl living in the woods behind us and, for some reason, I find him and his sounds very comforting. The owl was gorgeous, MJ! As I told Coming East, I watched two more owls last night. I love the wildlife that surrounds our neighborhood. While out walking the other morning, I passed a deer grazing. Neither one of us was phased by the other. And yes – I like the sounds of an owl, too. I say, Wow! as well. The circle of life happened right before your very eyes! The circle of life is amazing – especially when you see it LIVE. Great photos, Lenore. I’ve not seen owls here, but I get the same feeling when a hawk arrives. It’s a visitor one doesn’t want to see, but then, there’s something about them that we can’t help but watch in amazement. All Gods’s creatures are special. 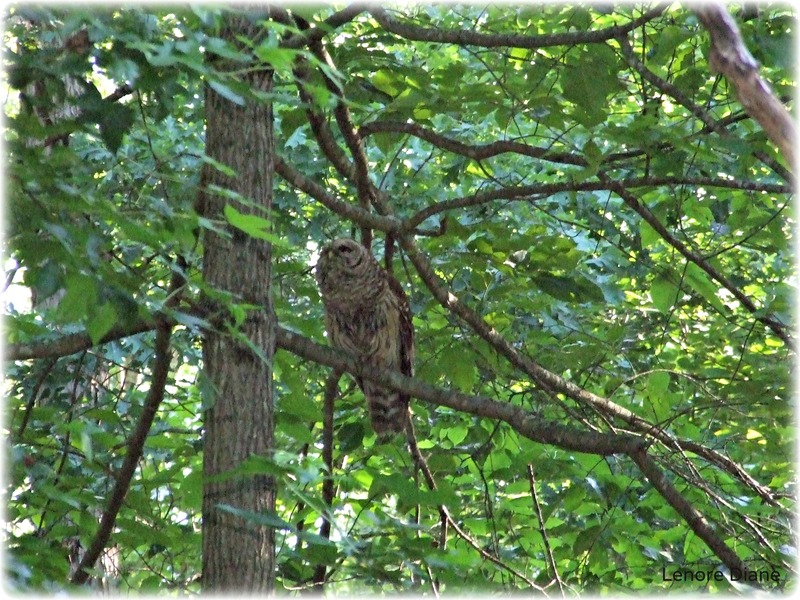 We are seeing this owl more and more (with so many chipmunks, I’m not surprised). There seems to be a family of them. I just heard one squawking a few minutes ago. I enjoy seeing and hearing the owls. God’s creatures. My fingers got ahead of me! What a wild thing to see! We see tons of hawks, too. Lately, the owls sightings are frequent. I am always amazed. I don’t know that I’ve ever seen an owl (outside of a zoo or what have you). I assumed they were nocturnal and it’s rare to see them. Pretty cool that you saw one and that he (?) stayed around long enough for the photo shoot! Remember the SuperMoon last month? That night I heard an owl. It was eery and wonderful at the same time. Had not heard it before, haven’t heard it since, but it was very vocal that night. We continue to see the owls, and I continue to be fascinated. Lately, we are seeing the owls around 7pm and 7am. Odd, I think, but I don’t know much about owls. Odd or not, I am enjoying each and every sighting. I do remember the SuperMoon. Funny that the owl was more active during that time. I’m sorry you haven’t heard him since the SuperMoon. Wow! What a cool series of events. And that you were there and present to observe the entire drama! Cool shots of the owl.